One of the main arguments of supporters held in September 1991, renaming the capital of Ural Sverdlovsk in Ekaterinburg it was necessary to return historical names. Although, as it turned out, originally the city was called differently. "The ancient city, long city, the DOE Catherine," as sings the famous Ural chansonnier Alexander Novikov, appeared on the banks of the Iset 18 Nov 1723. On this day in the shops built by Decree of Peter I of an iron (steel) factory workers made the first launch of bloomery combat hammers. Curiously, the official city Day in Ekaterinburg is traditionally celebrated in November, and on the third Sunday of August. Another interesting detail: the construction of the region's first steel plant was a "stumbling block" in relations between the initiator by Vasily Tatishchev and industrialist Tula Nikita Demidov, previously directed by Peter for the development of the rich ore of the Ural land. From opals Tatishchev and future forming plant saved the Royal inspector, the Dutchman William de Gennin. Thanks to his support, the enterprise was built. It Tatischev and de Gennin was founded in the Urals, Russia's new city, naming it in honor of the wife of Peter and the future Empress Catherine I. the first version, which lasted three years, was Ekaterininsky (Katerinis). Also, especially zealously supported by later representatives of the Russian Orthodox Church, Russian Orthodox Church, which is the choice of name was influenced by the patronage of mining and metallurgy from St Catherine. For the first time about changing the name of Yekaterinburg, as well as, incidentally, of St. Petersburg, spoke at the beginning of the First world war, the main opponent to Russia was Germany. Because of this, the country and the question was raised about the "Russification" of the cities are named after the type of German. Among other options, proposed by the public, was all the same Ekaterininsky and Ekaterinaris, Ekaterina-Petrovsk, Ekaterinograd, Grado-Isetsk, Iseto-Grad and others. In analogy to Petrograd in 1914 at the request of Nicholas the II was called Saint Petersburg, was proposed and Ekaterinograd. But to change the name under the tsarist regime the Ural activists did not, they prevented the revolution and the Civil war. During the last Ekaterinburg has repeatedly passed from hand to hand and became world famous as the city where I shot the last Russian Tsar and his family. Legal to rename "John DOE Catherine" it came in the fall of 1924. October 14 this year, the city Council adopted the decision on the award of the Yekaterinburg named Yakov Sverdlov. In the revolutionary of 1905 and 1917, this man was one of the leaders of the Bolshevik party organization of Yekaterinburg and the Urals. On 6 November, the decision of deputies was approved by the Decree of the Central Executive Committee, which was led after the October revolution just Sverdlov. In memory of one of the "ardent revolutionaries", who died in 1919, later called renamed is still Sverdlovsk oblast. In the city, nowadays the capital of the Ural Federal district, there are still Sverdlova. 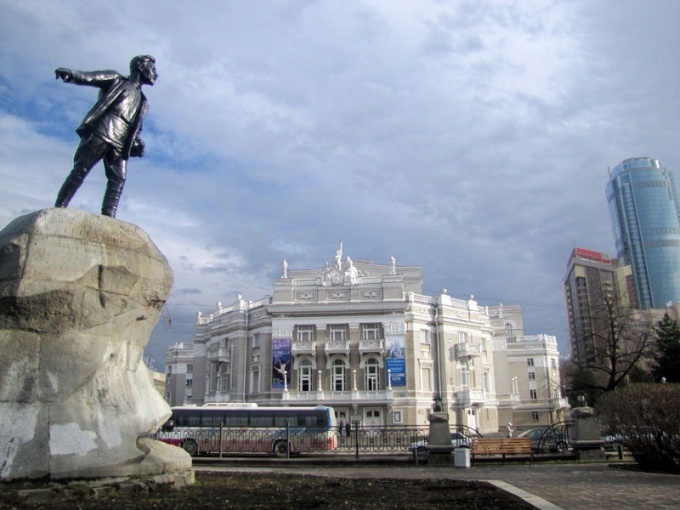 There is in Ekaterinburg and the memorial Museum of Yakov and established in 1927, opposite the present theatre of Opera and ballet the granite monument first "President" of Soviet Russia. Again the Yekaterinburg city Tatischev and de gennine was at the very end of Soviet history, 23 September 1991. With unanimous support from the population of the Sverdlovsk deputies decision of 4 September of the same year is not found. Moreover, against the return of pre-revolutionary names were made by a significant proportion of residents who love is of the Sverdlovsk and did not want to have anything to communicate with either Catherine (Martha) skavronskaia, no mythical Saint. As during the First world war, there were alternative suggestions for the title. Among other it was suggested, in particular, Urethral, Isetsk, and in honor of the actual founders of the city Tatischev and de Gennin. However, the majority of deputies have voted for Ekaterinburg. And the city's largest newspaper, the abbreviated name of "Vecherka", the next day came out with the headline on the front page: "bye, Sverdlovsk, Hello, Yekaterinburg!". He always, as the shot pulls, the soul sings...".